There are some places in this country’s great outdoors that have become quintessentially “American” – the mighty Grand Canyon, the granite rock faces of Yosemite, the forests of the Blue Ridge Mountains – and families, friends, and people from all around the world travel great distances to see these sights with their own eyes. Yet, there are other places throughout the country that are much less visited, but no less embodied in what people envision when they think of the vast landscapes and abundant wildlife of America. The Upper Missouri River Breaks National Monument in Montana is one of those places. Floating down the Upper Missouri River is like entering one of those paintings you often see of the west from the 1800s: dry rugged hillsides, with a lush riparian valley filled with wildlife that drink from and depend upon the life-giving waters of the Missouri River. The gentle waters are suitable for all ages, and the sights along the way can equally inspire whether it is your first time visiting, or whether you’re one of those that returns to this special place each year. The Missouri River is the longest river in North America. Stretching 2,341 miles from western Montana’s Rocky Mountains to its confluence with the Mississippi River at St. Louis, the watershed includes an area of 529,350 sq mi covering most of Montana, North Dakota, South Dakota, Nebraska, Wyoming, Kansas, Missouri, and parts of Iowa, Minnesota, Colorado, and of Alberta and Saskatchewan in Canada. The river has only one section designated as a National Wild and Scenic River throughout its Montana stretch, and this beautiful section flows through the Upper Missouri River Breaks National Monument. This area in north central Montana is the focus of a larger conservation effort where, in addition to the monument, the Charles M. Russell National Wildlife Refuge and the American Prairie Reserve all together will hopefully protect over 3 million acres of Montana’s grassland ecosystems. 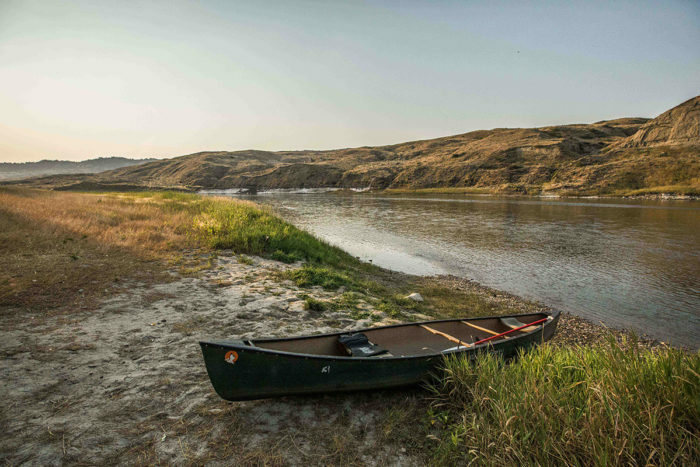 To see the Upper Missouri River Breaks National Monument the right way, one needs to paddle. The wild Missouri River for which the monument is named is the heart of this protected area, and rightly so. The river meanders through a valley that slowly changes from rolling grassy meadows, to steep white-walled cliffs and badland rock formations, with wildlife the entire way. The area has a long history with native Americans, and Lewis and Clark explored this part of the Upper Missouri during their expedition in 1805. Grizzly bears and bison were numerous in this region, but they are now absent from the valley and mostly replaced with cows. Other wildlife such as bighorn sheep, elk, prairie dogs, bald eagles, and several species of large fish are abundant. The river system still gives the visitor a taste of what this country was before it was settled by Europeans. There is a gentle wildness that embraces those who are lucky enough to experience these waters firsthand. The river pulses with life, and the primal feelings that this beautiful landscape draws out of us cause many visitors to come back again and again. We rented a canoe from the outfitter Adventure Bound Canoe and Shuttle Co. and put in at Coal Banks Landing, where there is a BLM visitor center run by helpful volunteers, and made plans for a take-out at Judith Landing. There are several options for put-in and take-out points. Our plan was to paddle from Coal Banks to Judith Landing for a total of 46 miles, which we did in three days – though this could easily be a four or five day trip for those that have time and would prefer to slow it down and perhaps do some day hikes along the way. As part of our trip to national monuments, Andreea and I took turns doing our research of the various monuments on our itinerary, and she researched the Upper Missouri River Breaks. So I did not really know what to expect. The landscape that unveiled itself before me throughout the next three days ended up being one of the wildest yet serene I have seen in the country. This section of the Upper Missouri River was described to be “one of the most beautiful places on Earth” by Stephen Ambrose in his book Undaunted Courage about the Lewis and Clark Expedition. It is a river that teems with life, both above and below the surface. The fish literally never stopped jumping throughout our three days on the river. Mule deer, several bald eagles, belted kingfishers, spiny softshell turtles, and a few Woodhouse’s toads along the banks kept us company on our journey. After 14.5 miles we arrived at our first campsite, called Eagle Creek Camp. Another small group of canoeists shared the site with us, and the hot sun gradually dipped behind the rock canyon wall across the river, letting through some of the night’s cool air. The days were hot. This summer was unusually dry for Montana, with temperatures in the 90s and not a lot of rain. Forest fires had been raging for weeks further to the west, which was apparent due to the amount of smoke in the air. But the river still flowed strong, and the cool waters were perfect for taking a dip. I would sit on the rocky bottom of the river with just my head above water facing upstream, feeling the powerful cool current rush past my body. The rhythm of the river was energizing, and, I don’t know how to say it other than that the river felt life-giving. At our second campsite, which was called “The Wall”, there was a prairie dog town behind us. Their impressive systems of tunnels and mounds always fascinated us, and this one behind our campsite was one of the largest ones we had seen. The soft light of the setting sun lit up the golden yellow grass, where prairie dogs stood up to keep watch. The prairie dogs would call out and react differently when Andreea or I moved from place to place to take photographs, or when a bird of prey would fly overhead, or when at one point a lone coyote made his presence known with a few barks just upstream of us. The season for canoeing usually goes from April or May until October, and different times obviously provide different landscapes. Springs will have wildflowers and cold weather, sometimes with a little ice and snow leftover from winter. Summers can be hot and dry, but great for swimming. And autumns can be filled with color from the cottonwoods, sycamores, and ash trees that line the river banks. Some of the groups we met while making our decent down the river were doing trips up to two weeks in length, continuing downstream through the entire National Wild and Scenic River portion of the Missouri. Local outfitters can tailor trips to each group’s liking. After seeing this river up close and knowing that conservation efforts are growing to bring back much of the native wildlife, including bison, we will be coming back to this river again in the future. Most Americans have already seen this place in paintings either in elementary school or in museums, but the real Upper Missouri River and its wild ecosystems is a place that shouldn’t just be a place we’ve seen from two hundred-year-old paintings; each of us should come to this area at least once to see its beauty with our own eyes, and to feel this river of life ourselves.